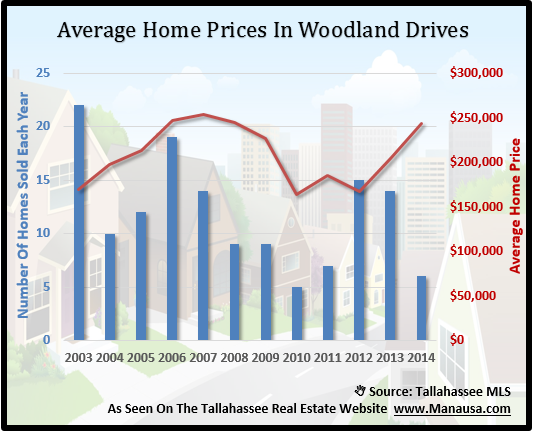 Centrally located Woodland Drives is an interesting neighborhood that has been a consistent performer among the top selling neighborhoods in the Tallahassee real estate market. While it does not produce the numbers like the top five subdivisions (Southwood, Golden Eagle Plantation, Killearn Estates, Killearn Lakes Plantation and Bull Run), it does see enough home sales to often times drop into the top 10 most active neighborhoods in the Tallahassee MLS. Thus far in 2014, there have been 5 homes sold in Woodland Drives, with an average sales price of $225,500 and a value of $108 per square foot. That means you are getting a 2,086 square foot home for $225K in a highly desirable downtown Tallahassee neighborhood. Currently, there are 8 homes for sale in Woodland Drives, all of which are priced at or below the average sales price over the past year. The average number of homes selling each month in Woodland Drives returned to normal back in 2012, and that pace continues through today. In the graph below, we see the number of closed home sales each year as blue columns (2014 is through 3/30), and the average home value, expressed as price per square foot, is shown as a red line. 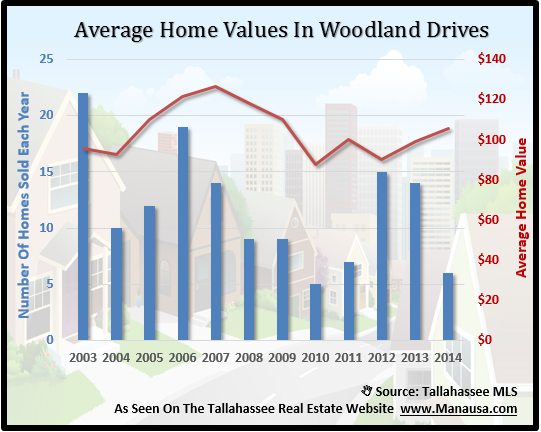 Like all other neighborhoods in Tallahassee, we see that average home values rose during the height of the housing market and then fall when it collapsed. Currently, average home values are on the rise again. Average home prices have rebounded so strongly that they are near where the peaked back in 2007. But this isn't going to last, as the current inventory of homes in Woodland Drives are smaller and on the market at lower prices. That is why we take the time to look not only at average prices, but average home values too (graph above). The following map shows the Woodland Drives homes that are on the market today. If you want more information on a particular home, simply click on the marker on the map and it will open up the listing to show you up to 25 pictures of each home. The following is a list of all homes sold in Woodland Drives (recorded in the Tallahassee MLS). I hope you were able to learn something from this Woodland Drives Home Sales Report, please drop me a note if you have any other questions or concerns that I can help you with.